With back-to-school upon us, it’s time to think about capturing that all-important first day. With just a little planning, you can snap some shots that will be treasured for posterity. Use them in albums, greeting cards and custom calendars to make the most of your photo shoot. Grade Chalkboard Sign Have your child create a drawing or piece of art that announces his or her grade, or write their year on a small chalkboard. Snap a shot of each of your children standing alone with the sign, then take a group shot of all the kids holding their signs together. It’s a great way to capture a moment in time – with each child in his or her unique new beginning about to unfold. If you live in a tight-knit community, you can even include the neighborhood children in the group shot. Grade Snapshot Announcement Cards Snap a cute portrait of your child, leaving some space to one side of the photograph – say a field of grass or a blank wall. Upload the photograph into a Mixbook photo card, then superimpose text over the open side of the photograph. List out the things that make your child so unique at this very moment – activities, food, likes, dislikes, etc. Print the cards and send them to family and friends to announce the start of a new year. Make it a tradition and everyone will look forward to getting the card each year. Old-School Photo Shoot Even though most of us, as parents, went to school with desks and classrooms that look roughly the same as the desks and classrooms our kids use today, there’s something fun about an old-school (so to speak) shot of a child sitting at an antique desk, wearing saddle shoes and plaid. Sure, it’s staged, but it’s darn cute, and friends and family will revel in the memories of what it meant to get an education back in the day. Frame the photo for your home, add it to a back-to-school album (I’ll write about that next week), or create a back-to-school announcement card to send to friends and family. Creative Backdrop Make it a fun end-of-summer activity to create a backdrop for your back-to-school photo. Use a large sheet of paper and decorate it using classic schoolroom décor, or have your kids make drawings and add decorative words, phrases and magazine clippings to represent their vision of what the year ahead will be like. Then have a photo shoot in front of your custom-made backdrop. Silly Shot for Older Kids For older kids, a back-to-school fashion shoot is a fun way to show off all their new clothes while they’re still in great condition (…while they still fit, or before they get lost!). Have your kids model all their new looks, and let them get as silly as they want to with mismatched socks, geek glasses, bubble gum, iPods and any other added props you can come up with. Snap your shots against a simple white wall or outside to take advantage of natural light. If you’re up for a party, have your kids invite friends for the event, then create a fun back-to-school photo book for everyone. Make sure you snap individual portraits of each child – with any luck one (of your children) will be perfect for a custom greeting card for family and friends. One Happy Mother There’s the rare parent who dreads having to give up her kids again when school starts. But most parents – especially moms – are typically thrilled to get a little more time to themselves again. 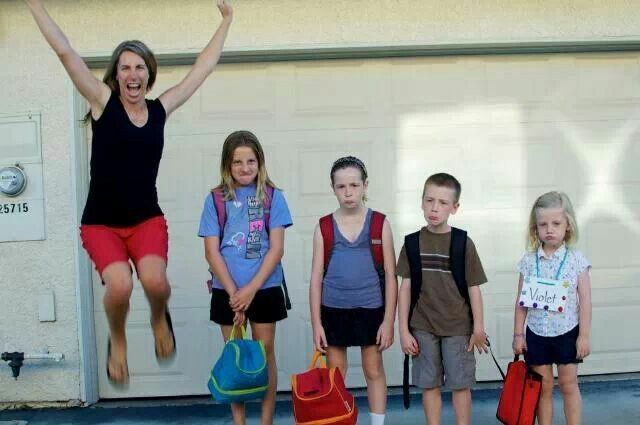 Snap a funny shot of a euphoric mom next to pouty children in their back-to-school duds. Use it for a greeting card and also for the final page in your back-to-school photo album.